-Sorcerer to the Crown by Zen Cho: so this was recommended to me on Twitter by Tiemen, who works at a bookstore, when I asked about epic fantasy debuts. I honestly don't know much about it, but I'm in! 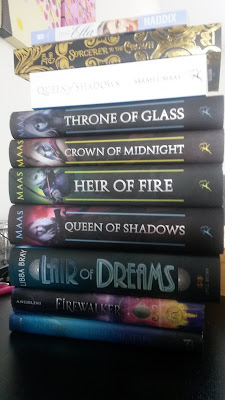 -Queen of Shadows by Sarah J. Maas: so this is the gorgeous paperback version that was already on its way when I decided I just HAD to have the hardcovers. So now I have a double set and I'm blisfully happy and also already started this and OMG SO GOOD! Queen of Shadows by Sarah J. Maas: because beautiful hardcovers are beautiful. -Lair of Dreams by Libba Bray: this thing is HUGE! But I totally loved The Diviners, so I really need to read this soon! -Firewalker by Josephine Angelini: I loved the first book in this series and decided to just order the second, even though I don't own the first and my orderly self hurts a little because of this. -The Shadow Behind the Stars by Rebecca Hahn: a book about the Fates. Do I really need to say more? -Worlds of Ink and Shadow by Lena Coakley: I'm SO excited about this book! I'm forever recommending Lena Coakley's Witchlanders, and now she's writing about the Brontë sisters? YES I'M IN!! -Never Never by Brianna Shrum: the story of Peter Pan through the eyes of Captain Hook. This should be very interesting! -Wedding Date for Hire by Jennifer Shirk: I LOVE the movie The Wedding Date, so I couldn't resist requesting this! -The Shadow Queen by C.J. Redwine: SO EXCITED!! This sounds like the start of an epic new fantasy series that screams READ ME! -Reign of Shadows by Sophie Jordan: I adore Sophie Jordan's writing and am excited to read a fantasy novel by her! -Flamecaster by Cinda Williams Chima: I couldn't click request fast enough for this one, OMG I CANNOT EVEN! The Seven Realms series is EVERYTHING and I can't wait to read this new novel set in the same world and *dies*. YAYYYYY! There was so much hype behind The Lair of Dreams that it prompted me to finally pick up The Diviners and I'm really enjoying it, so I'm excited! So glad you're enjoying The Diviners!! Oooh!! I just bought Lair of Dreams last night. I'm just a few chapters into it so far. Yay! :) Hope you're enjoying it! That's one seriously amazing book haul! Hope you enjoy all your new books. I liked Sorcerer to the Crown! And the completed version is really pretty... I have the ARC, but it doesn't have the gold on it! Ooh Sorcerer to the Crown has a beautiful spine! I've been wanting to read Just Ella for years, I love retellings. The ToG hardcovers are soooooo pretty!! The Shadow Queen and Flamecaster!!!!! Ahhhhhhh so jealous!!! I love the Seven Realms series, I can't believe we're getting a companion series. Best thing ever.